Shocking Pink Pure Banarsi long shirt embellished with embroidered neck sleeve and heavy border on bottom and golden banarsi fabric is used on hemline. 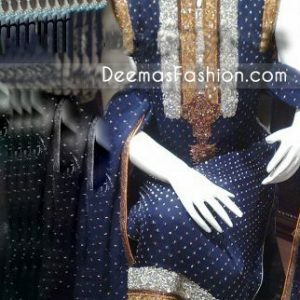 Embroidery includes using sequins pearls shaped beads, kora, tilla and crystals. Finished with green piping on neck, sleeves and hemline. Shocking Pink banarsi chiffon dupatta embroidered on borders and finished with green piping on edges.